Do you know Civil War in Syria, don't you? 🚌 🚌 🚌 Three buses became a barricade to protect civilians. in the world who are working for cessation of war and peace." Halbouni wants to deliver the message of 'hope' through the symbolling 'agony of Aleppo'. Aleppo in Syria was the most ferocious battlefield. Syrian President Bashar al-Assad, government force started a death battle against Syria rebel armies in July, 2012. The brutal tragedy had been going up to December last year when rebel armies retreated. Aleppo was the important strategic position which was taken by rebel armies. So, government force kept attacking hard to take it back. As a result, Aleppo became ashes which was the most commercial city and had more than 2 million Syrian. The children fell beneath the crashed debris and died due to the brutal attack of the government force. Last August, a picture of five-year-old Omran Daqneesh who was rescued from a rubble due to the air attack of the government force brought big issue in the world reporting tragedy of Syria. 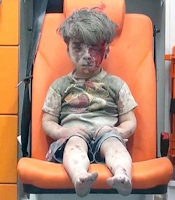 📷 2016, Aught 17, Omran Daqneesh who was rescued from a pile of rubble due to the air attack in Syria Aleppo. A boy who is covered with dust and blood are testifying tragedy of the civil war by itself. 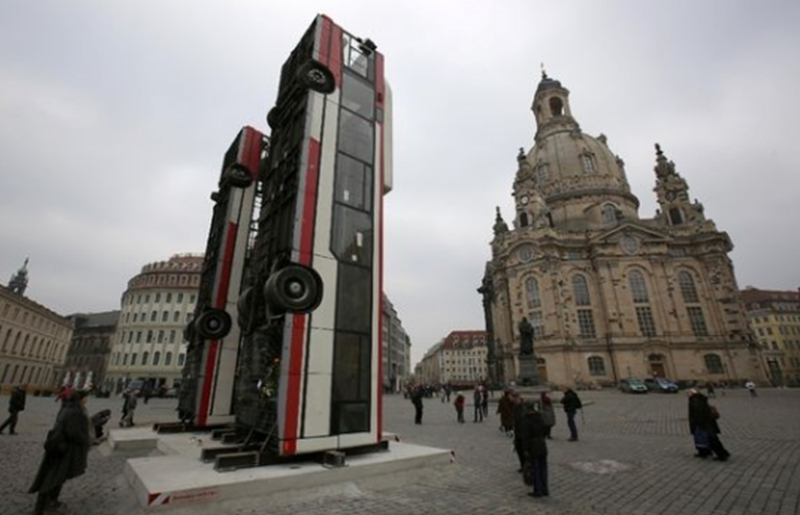 art piece which was installed in front of Frauenkirche church. A bullet from a sniper was another threat on top of numerous bombing in Aleppo. In last 2015, three buses was placed on the street to protect civilians against a sniper of the government force. 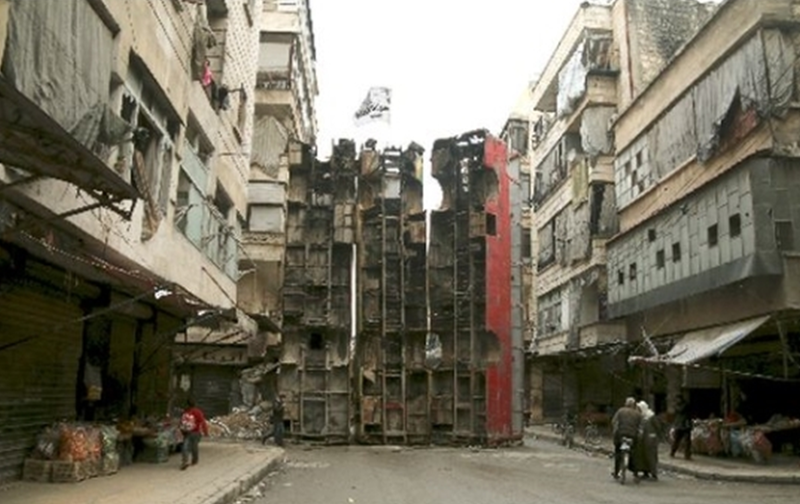 On 2015, March 21, Reuter broadcasted a picture of vertical buses which was placed in Al Qasr which was taken by rebel armies in Aleppo. Frauenkirche church in Dresden, Germany. 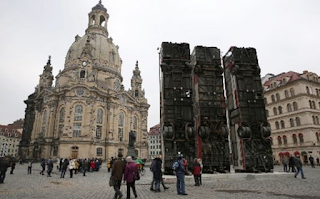 80% of Dresden was destroyed for 4 days from 1945, February 13 due to allied forces 'air bombing'. Official dead was 25,000. 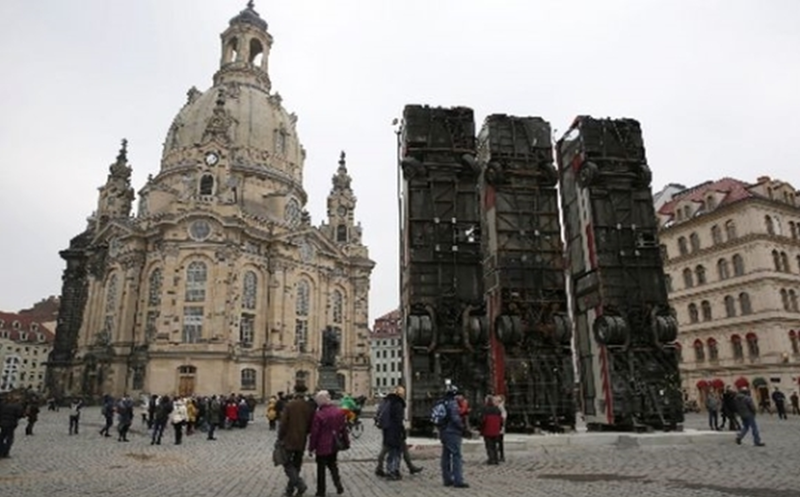 After that, with designated will and efforts, Dresden was rebuilt as a center of industries as if the old East Germany. Now this city stands for peace and unification. Dresden became a major industrial center in Europe. 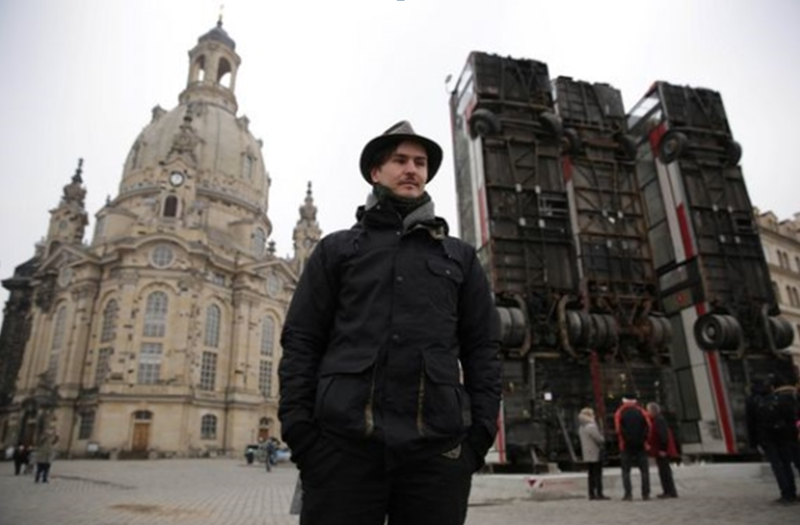 Dresden is also financially independent along with Wolfsburg among cities in Germany. 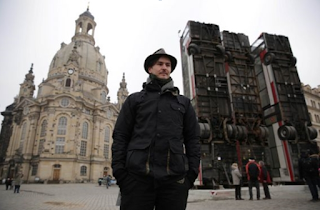 Halbouni wants to deliver the message of 'hope' through the Monument symbolling 'agony of Aleppo'. He said "Citizens of Aleppo did not stop putting efforts on their lives during consistent war. I'd like to thank to the people in the world who are working for cessation of war and peace."